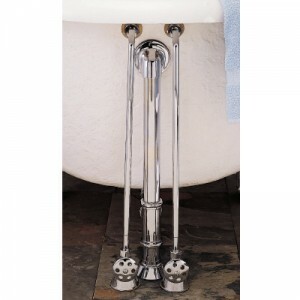 Left and Right Leg Tub Supply Set, Single Offset 1/2″ OD Tubing, Centers Variable. Goes into 1/2″ Ips, fits 3/4″ Ips at Faucet. Comes with Polished Brass Nuts, Floor Esc. & Washers, Ready for Installation, Approx 26″ High. Includes 2 Straight Stops.